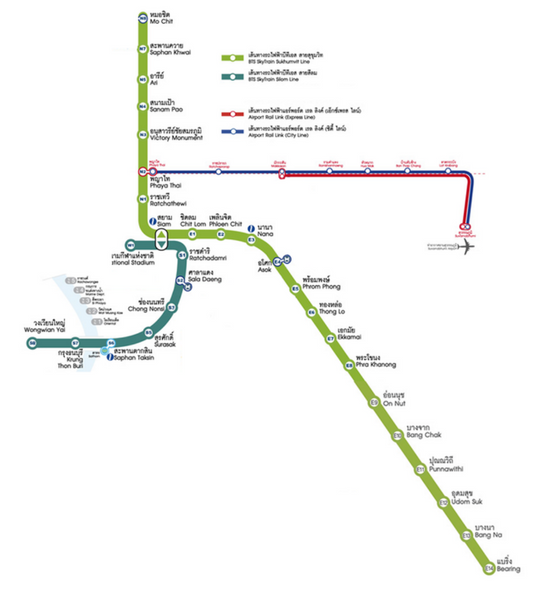 Bangkok can be almost completely navigated by a series of Skytrain lines, subways, buses, and boats. In addition to all of the public transportation options available, you can also easily get around Bangkok by taxi or motorbike. The options for travel are endless, but if you want to travel how the locals do, you need to take the BTS. 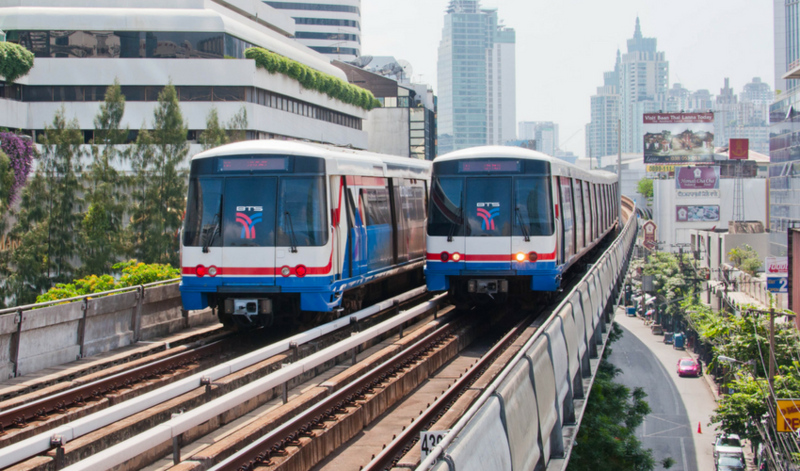 The BTS, or Bangkok Mass Transit System, consists of two high-speed Skytrains that meet at Siam Station and split in two different directions, making up the Sukhumvit and Silom lines. From the BTS you can jump on the MRT (Metropolitan Rapid Transit) and explore more of the city, take a local bus, or even jump on a boat. Silom and Sukhumvit are the two major arteries of Bangkok and both are very much worth exploring. You can buy tickets to ride the BTS right at any conveniently located station either from machines or ticket vendors directly. If you are planning on staying in Bangkok for an extended period of time and riding the Skytrain often, you might want to consider buying a BTS card and filling it with money so you do not have to wait in line every day. Trains arrive every five to eight minutes and are the most cost-effective and quick way to see Bangkok, especially during the busy rush hour! There are maps available in every station and online. Keep in mind that Silom line runs from National Stadium to Bang Wa and Sukhumvit line runs from Mo Chit to Bearing. Both lines meet at Siam Station. Where will you go once you've boarded the BTS? Let's explore some of the best Bangkok has to offer along the Sukhumvit line! Asok is famous for its incredible shopping, great food, and fun nightlife. Check out the iconic Terminal 21 for a day at the mall with a twist. Terminal 21 has themed floors, and tons of care has been put into making each floor special and unique. From Paris to the Carribean, you'll travel the world without needing your passport. Even if you are just window shopping, you will enjoy sipping a traditional Thai Iced Tea while browsing through the floors of this eclectic and interesting shopping center. Asok also has excellent restaurants for every taste, plus some of the best street food in Bangkok. Enjoy tropical fruits that you would never see at home, like fresh papaya, dragonfruit, and sweet pineapple. Sit down for a bowl of Bangkok's famous noodle soup or enjoy fried chicken or small, flavorful coconut puddings. Street food put Bangkok on the map, so no trip to the City of Angels would be complete without trying it. Asok also has some great nightlife and rooftop bars like Vertigo and Octave Rooftop Bar. From any of these establishments, you will get an unparalleled view of the entire city. Phrom Phong is a great place to jump off the BTS because there are so many different activities to enjoy. From shopping to sports, Phrom Phong really has it all. You will find no finer luxury shopping in Bangkok than in Phrom Phong. It really is the place to be if you are looking for luxury goods at reasonable prices. The opulent EmQuartier and Emporium sit right across the street from each other and are easily accessible from the Bangkok BTS. Choose either, or both, and prepare yourself for a day of luxury shopping in Bangkok's most beautiful malls. With stores like Chanel, Louis Vuitton, Prada and Jimmy Choo, you will want to have your credit card with the highest balance available. Even if the luxury brands are out of your financial reach, it's still worth checking out these Bangkok institutions and spending an hour or two soaking in the air conditioning. Phrom Phong is also home to Bangkok's premiere indoor surfing venue called Flow House. You do not need to hit Bali's epic coasts to catch some amazing waves. At Flow House, you can work with their coaches until you get your sea legs. Even novices will feel at home at Flow House. If surfing is not your thing, you can always visit Dinosaur Planet and marvel at some giant life-sized prehistoric creatures. Dinosaur Planet also has a Ferris wheel with an amazing view where you can see the entire city. After a day of luxury shopping, surfing, and checking out the dinosaurs of the past, you might be a little hungry. Luckily, Phrom Phong is one of Bangkok's foodie destinations with options ranging from traditional Thai favorites like Som Tum, Pad Thai, and Mango Sticky Rice, to Italian and Indian food. Whatever you are in the mood for, you can be sure to find it on Phrom Phong. Close to Asok and Phrom Phong, you'll find the glamorous Thong Lo BTS. Thong Lo is an upscale neighborhood that boasts some incredible cafes, fine dining options, and great spas. If you are looking to unwind and grab a yoga class, head to Thong Lo for several amazing options. If you want to grab a pedicure, get your hair done, or book a teeth whitening appointment, Thong Lo is your best bet. Beautifying in the City of Angels is a nice way to pass the afternoon! Thong Lo is also home to some of the most eclectic and fashionable nightlife Bangkok has to offer. Iron Faries, located right on Thong Lo, is a whimsical craft cocktail bar with three floors and excellent jazz music. Sing Sing is a mere two or three-minute walk from the BTS station and is a club that reminds visitors of old Shanghai. For a memorable night out get to Sing Sing early and grab a table with a view of the main stage. You'll see performers on swings, in cages and dancing below. Siam station is the beating heart of Bangkok. It is where the Silom and Sukhumvit lines meet, so the station itself is really busy and can get confusing. If you are heading to Siam it is helpful to familiarize yourself with the station before leaving so you are able to effectively navigate through, especially if you plan on changing trains. Siam is home to CentralWorld and Siam Paragon, two of the biggest malls in Thailand. You will not just get your shopping done either. Both of these Bangkok staples have tons of events and exhibitions, as well as some first-class dining options. Explore the Gourmet Market, or grab a burger at the Paragon Food Hall. There is also a hidden gem at Siam Paragon; an underground world full of sea creatures! The best aquarium in Thailand is tucked underneath this first-class shopping complex. Sea Life Bangkok Ocean World has hundreds of different animals and astounding displays that showcase the most incredible sea life. Sea Life Bangkok Ocean World is the largest aquarium in Southeast Asia and it is right there at Siam station. If you find yourself traveling on the BTS in the evening and want to check out a Bangkok sunset from a truly unique location, visit Centara Grand's Red Sky bar. Red Sky is one of the premier rooftop bars in the entire city and boasts unbelievable views. Take the BTS Sukhumvit Line to the very end and you will find one of the best and biggest outdoor markets that you have ever seen. Every Saturday and Sunday, Mo Chit is the location of Thailand's famous Chatuchak Weekend Market. The Chatuchak Weekend Market is a sprawling expanse of vendors selling everything from scented soaps, to t-shirts, to even exotic pets. Although there is order to Chatuchak's madness, it can be a little overwhelming for people who are not familiar with the market, so it is best to check out a map online before attending. It is easy to spend hours at Chatuchak Weekend Market, but the broiling temperatures might be too much for some. Visitors will find it best to alternate between the indoor and outdoor stalls and remember to cool off with a delicious coconut ice cream. A trip to Chatuchak Weekend Market is a must for anyone visiting Bangkok. You will find unique and memorable souvenirs and maybe even pick up an interesting bit of Thailand for yourself. Now that you know where to go, let's talk about the logistics of riding the BTS. You can easily buy single fare tickets to ride the BTS, although if you are staying for a longer period of time or plan on riding the Skytrain often during your visit, you will want to consider buying a BTS card that you can fill with money. If you have a BTS card you will avoid long lines and be able to breeze right through. If you are planning on purchasing tickets from the BTS machines, you will most likely need correct change, so remember to keep those baht coins for your BTS trips! The BTS is the best way to get around Bangkok, but it does not run all of the time. The first train leaves at 6 am and the final one departs at midnight. If you are traveling outside of those times you will need to find another form of transportation. Rush hour, which runs from 7 am to 9 am and 4 pm to 7 pm, will be very busy. If you are planning on traveling during these times, you will want to give yourself plenty of time to arrive at your destination and be especially patient. Trains running in peak hours can be very crowded, so if you suffer from claustrophobia or have issues with big crowds, you will want to avoid these times. Overall, even during peak hours, the BTS is extremely efficient. If the train you were waiting for is full, there will be another within a few minutes. Sometimes it is better to wait for a less crowded train. We have highlighted the best of Sukhumvit Line in this guide, but you should take your time in Bangkok to explore Silom as well. Bangkok is a very safe city, so getting off the beaten path is not a problem, especially during the day. You will also find that Bangkok residents are very interested in helping and guiding you around the city.